Highlighting lush, layered flavors, bright acidity and impeccably balanced French oak, Migration is dedicated to crafting wines from the finest cool-climate winegrowing regions. Established in 1973, Bien Nacido has earned a reputation as one of California’s premier vineyards. Our prized blocks include original 1973 plantings, as well as vines planted in 1991. Grown in soils with abundant limestone, these older vines produce a gorgeous Chardonnay with complex minerality, a lovely texture and multilayered citrus and orange blossom flavors. 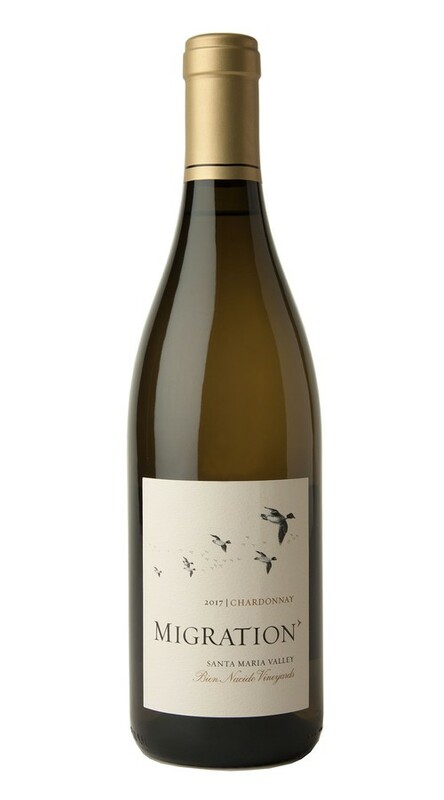 Widely recognized as one of California’s greatest vineyards, Bien Nacido has once again yielded a dazzling Chardonnay with vibrant acidity and pure, focused fruit flavors. On the palate, layers of zesty citrus, Honeycrisp apple and orange blossom are underscored by a beautifully balanced structure and just a touch of sweet French oak. The 2017 growing season in Santa Barbara County was peaceful and perfect, with ideal early-season rains, nice warm weather throughout late spring and summer, regular cooling fog and no major heat events—all of which are optimum for growing world-class Pinot Noir and Chardonnay. We hand-harvested our grapes in Santa Rita Hills and Santa Maria Valley over the course of ten days, with small clusters and berries yielding wines with an abundance of bright fruit and great intensity.